As the U.S. Open has kicked into full swing, and rising temperatures have kicked into full swing with it, the tournament thus far has faced its challenges. On Tuesday, August 28th, French tennis player Alize Cornet, in a match against Sweden’s Johanna Larsson, received a code violation for briefly taking off her shirt during her first-round match. Cornet had returned from changing clothes on a break when she realized her shirt was on backwards and decided to switch it around. As a result, Cornet was issued a code violation for unsportsmanlike conduct. Backlash from people across the world ensued as a result of the violation Cornet received, as male tennis players regularly remove their shirts on the court. On the same day as Cornet’s violation, Switzerland’s Timea Bacsinszky had to argue with tournament personnel to use a different room to change her shirt. They only allowed her to use a public restroom and, consequently, in between sets, she was bombarded with fans asking for photos. Additionally, such issues follow comments made by Bernard Giudicelli, President of the French Tennis Federation, about Serena Williams’ “catsuit” worn at the French Open. He cited her attire as an instance of “going too far,” highlighting the need for a dress code. 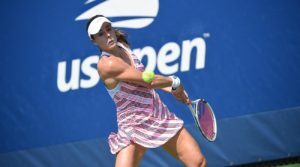 While such issues have simply further highlighted the different standards for men and women in society, the USTA quickly apologized to Cornet and, subsequently, issued a statement saying that, “All players can change their shirts when sitting in the player chair.” In regard to the code violation Cornet received, no fine was issued and the USTA issued a statement claiming that they “have clarified the policy to ensure this will not happen moving forward” (www.tennis.com).